£10,000 scholarships available, plus world-class sports amenities. This article is sponsored by the University of St Andrews. First, an admission. This is sponsored content: the University of St Andrews has paid to get this article on Ultiworld. Normally, lots of people would stop reading at that stage. But in this context, the fact that it’s sponsored is itself the interesting story. There really is a college – not the players, not the alumni, but the Sports Department – willing to pay to advertise their programme. And willing to fund £10,000 scholarships. The bottom line is that we’re serious about ultimate, and it’s supported here just like other established sports – in fact, it’s way ahead of most of them. If you’re interested in what that looks like, then read on. And if you’re considering where to study, either as an undergraduate or postgraduate student – and you’re open to studying in Scotland – then give it some thought. It’s an ambitious ultimate program, at one of the UK’s top academic institutions, in one of the most pleasant communities you could hope to visit. Here’s our advert – thanks for reading. St Salvator’s Hall. Student Accommodation at St Andrews University. St Andrews is a small and beautiful seaside town on the East coast of Scotland, home to about 20,000 people (of which around one-third are students). The University is not on a separate campus but dotted throughout the town in historic buildings nestled among the beaches, golf courses, and cafés. Over the last 600 years, the University of St Andrews has established a reputation as one of the world’s leading research and teaching centres. Today, the University offers a flexible degree structure based on your choice of subject or research specialization, creating an environment which nurtures inquisitive minds and a culture of shared learning. 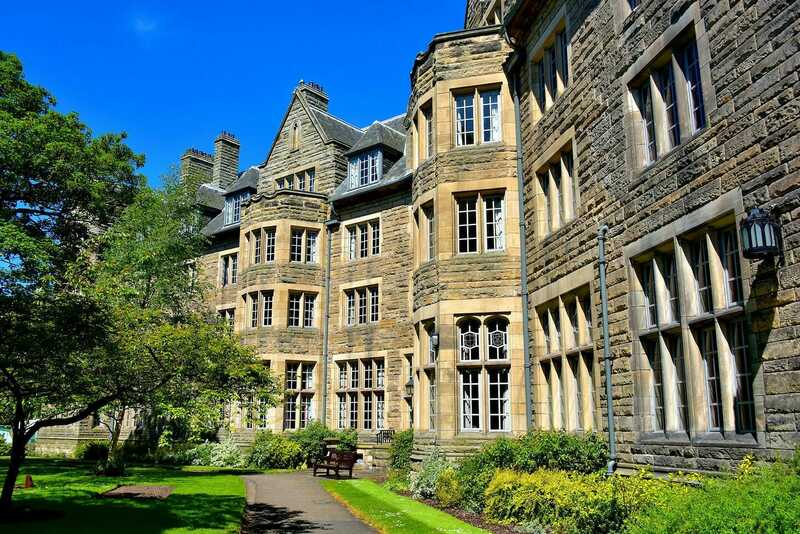 St Andrews offers students from all over the world an outstanding academic education with research-led teaching and a truly unique student experience. The University’s size gives students at all levels access to top academic staff, and, with students from over 140 different countries and territories, every individual gets a truly international experience. University ultimate is recognised by British Universities & Colleges Sport (BUCS), the national governing body for Higher Education sport in the UK, and the approximate equivalent of the NCAA. St Andrews is the most international Scottish university, with staff and students from over 140 nationalities. Students from all over the world, and from a wide range of backgrounds, come to study with us. With a high proportion of students coming from countries with greater exposure to ultimate, such as North America, St Andrews is ideally placed to become the best and most successful student ultimate club in Europe. 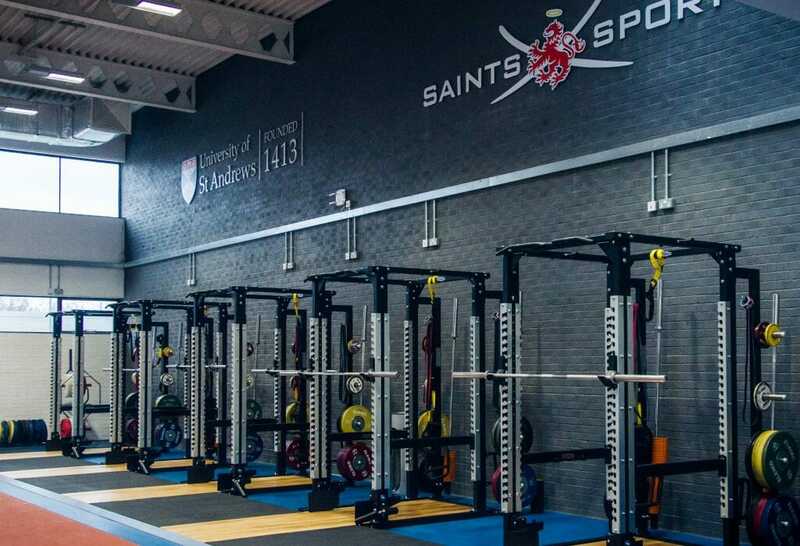 Saints Ultimate is one of 12 performance sports at St Andrews, benefiting from increased support and a dedicated sports-specific Director. The programme is on a par with other mainstream sports at the University and leading the way in the higher education sector in the UK. The club currently competes in Men’s, Women’s and Mixed series (regionals and nationals; both indoors and outdoors), as well as a number of casual tournaments and a weekly Wednesday league with standalone home and away matches against other Scottish college teams. The Men’s 1st Team have a very strong recent record, with 2017 bringing a BUCS Indoor National title, a second successive win in the top Scottish league, a Varsity win over rivals Edinburgh, and many other victories at smaller events throughout the year. The Men’s 2nd Team also qualified for BUCS Nationals in 2017 – finishing comfortably the best second team in the Conference Cup – while the Women’s 1st Team achieved 6th at BUCS Nationals and the Mixed 1st Team lost out only to the UK National Champions. The University encourages individual sporting excellence by providing support to talented athletes who are studying at St Andrews and who represent their country at an international level. In 2018, seven current or recently graduated members of Saints Ultimate competed at the WFDF World U24 Ultimate Championships in Perth, Australia, for Great Britain or Ireland, and were funded for the large majority of their training, travel and competition costs. A few of our elite graduates have also helped to start some of the most successful club teams in the UK & Europe – Iceni, Black Eagles, SMOG – but we also aim to provide opportunities for everyone to participate, so nothing makes us happier than seeing our players continuing to play after they’ve graduated, no matter the level. 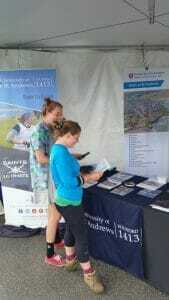 Lisa Pitcaithley and Jesse Shofner eying recruitment materials at USAU D-I College Nationals. Saints Ultimate has a great track record of training up new players, but we benefit hugely from the input of new recruits with high school experience. And for those considering postgraduate options, it is also worth noting that there is no five year eligibility restriction in the UK. a full-time Director of Ultimate, who runs the squad sessions, provides individual throwing sessions, and generally helps the club to run smoothly. significant funding for travel, accommodation, tournament entry, etc. Starting this year, we are for the first time able to offer scholarship opportunities for taught postgraduate courses. The scholarship would be for 50% of the course fees, meaning a saving of around £10,000. There is no fixed limit to the number of scholarships awarded, but they will only be offered to truly exceptional candidates. The aim is to recruit world class players who will impact the programme positively both on and off the pitch. Please contact the Director of Ultimate to discuss. There is no deadline for scholarship applications other than the application deadlines for individual courses. All decisions will be made by the Director of Ultimate. If you have questions about studying in St Andrews, you can meet up with University staff either in Scotland or in your own country. You can also contact Benji Heywood, Director of Ultimate, with questions about the programme. Find more information at saints-ultimate.com. Comments on "Scottish University Offers Both Premier Ultimate Program, Premier Education"